I have to admit, Hondas are not my go-to when I’m looking for a feature car. In fact, besides an NSX or the occasional built S2000, I can’t say that I’ve ever really sought after any Hondas to shoot before. However, Inspire USA’s two Type Rx Hondas are something a bit special; I would even go as far as saying that these are actually two of the best cars Honda ever made. Both Type Rs are vastly enhanced versions of a base model that was essentially a humble commuter vehicle; something dreamed up by the marketing department that would sell en masse for cheap. Growing up I had plenty of friends whose first cars were some version of a Civic or Integra; these exact models are the quintessential Hondas of my time. In other words, a little bit boring. The Type R on the other hand was the lighter, more powerful, circuit tuned version. The very best Honda you could get your hands on in the year 2000 (without stepping up to already-mentioned NSX or S2K, both of which were sort of outside the realm of Honda’s bread and butter) would have been one of these two cars you see here. Certainly not boring either, especially after a healthy dose of aftermarket tuning. 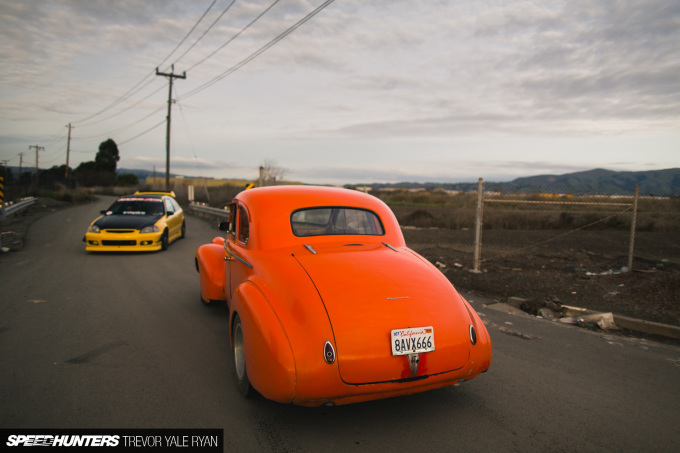 It’s worth mentioning that their owner, Eric Tsoi, has had over 100 cars in his time. When you consider the number of makes and models that have come and gone, it’s no mistake that these two have been in his collection for a decade now. 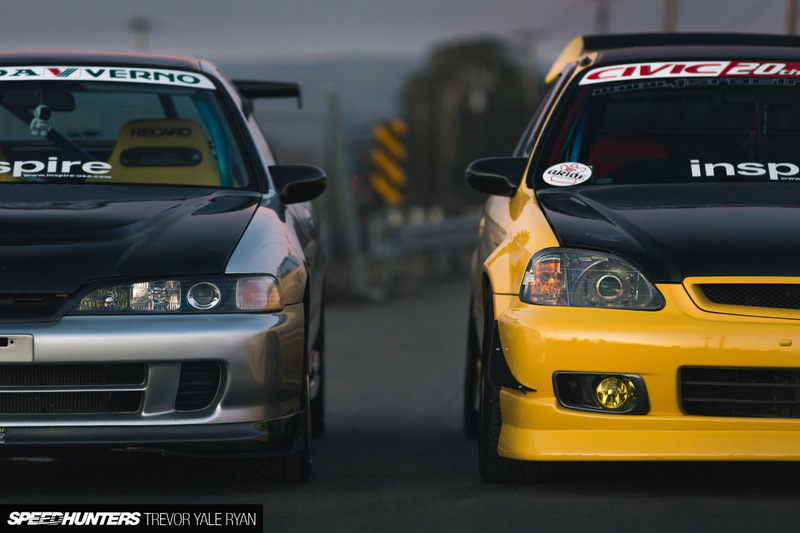 The DC2 and EK9 are two cars that Eric just can’t bear to part with; they’ve been modified heavily and they’re just at a good point where he can hop in and enjoy either one. When they aren’t being driven they create a good bit of fanboy buzz in the shop at Inspire USA; here in the States seeing a legit right-hand drive Type R is not a common thing. 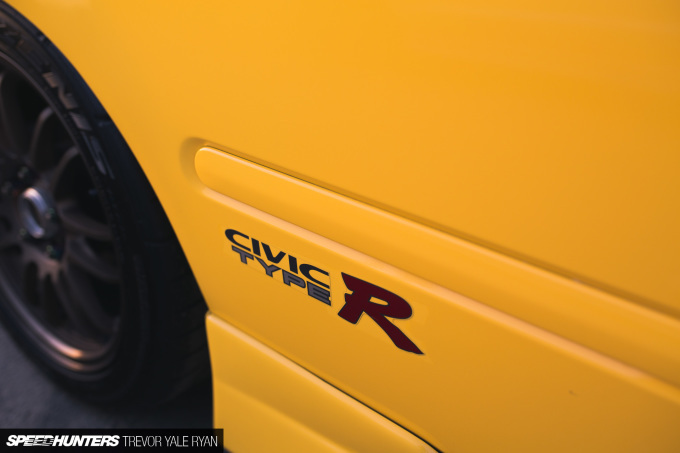 In fact, the Civic Type R of this era was never offered stateside, so any one you come across had to be imported. 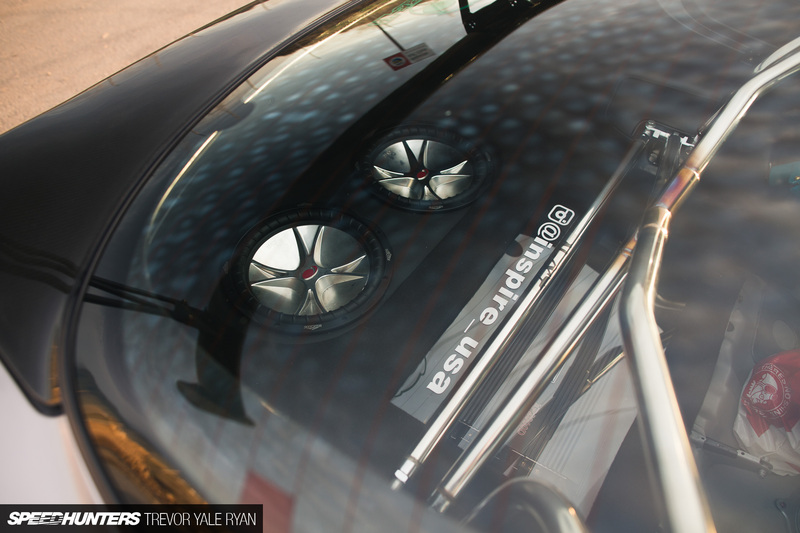 Then, there’s just that intangible vibe about the way these cars have been set up. 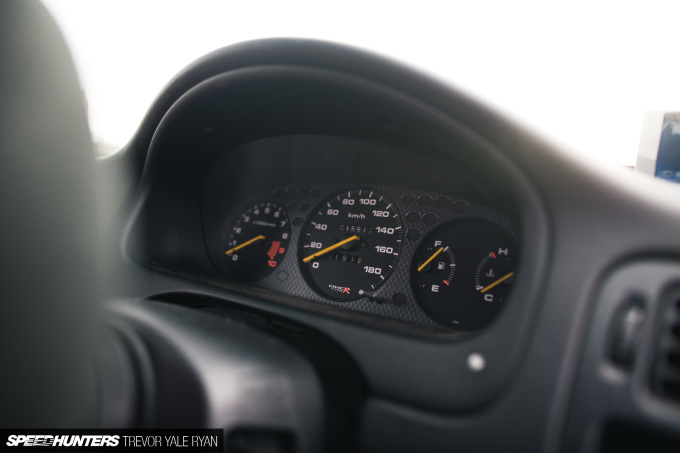 It’s something you can’t quite put your finger on, but the more time I spent around them the more I had a burning desire to get behind the wheel. But when presented with the choice, which one would you hop into? I’d previously thought that the Integra would be a hands-down winner on paper, but once I looked a little more closely, this isn’t the case. Actually, they’re both about the same size, weight, and power output from the factory, with just 12hp separating them. I suppose the only way to really sort which one is the better car is to dive into each build. I have to say I wholeheartedly agree with the judge’s decision; there’s something about this car that’s just spot on. 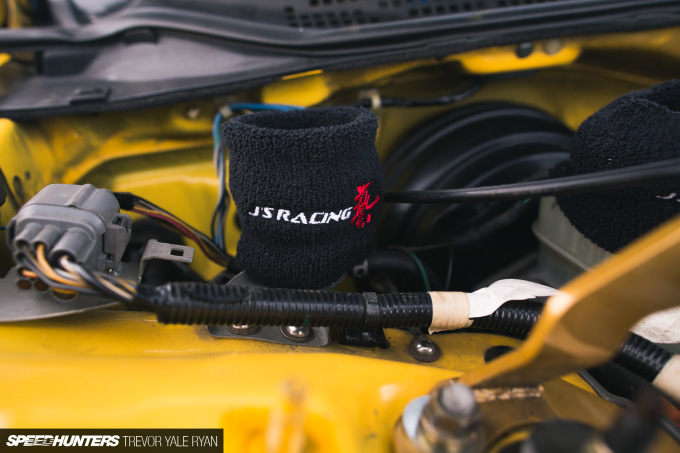 All of the Type R goodies in conjunction with the J’s Racing aftermarket bits just come together so nicely. Walking around the exterior there are so many things that are so right about it. 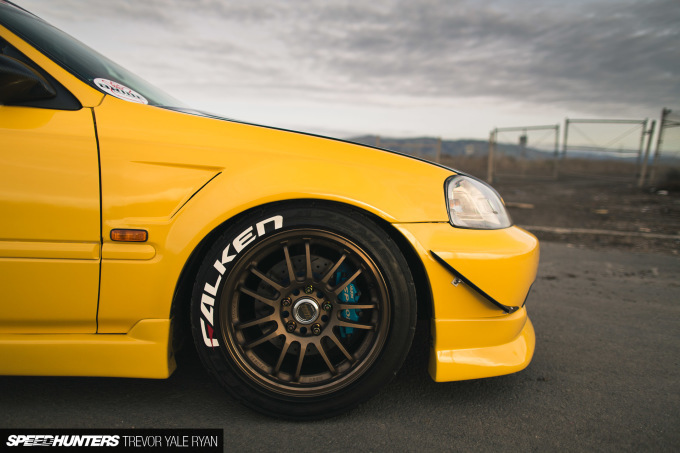 The RAYS Volk Racing RE30s and Chargespeed full lip kit works well with the J’s Racing fenders and canards; these parts along with many more give that late ’90s look the aggressive edge it needed. And with Spoon calipers hiding behind, you know this car is just at home on the back roads as it is at a show or a meet. The mod list is pratically endless, including Inspire USA carbon fiber mirrors, rear hatch, and hood alongside other carbon fiber bits like the Seeker spoiler and roof. 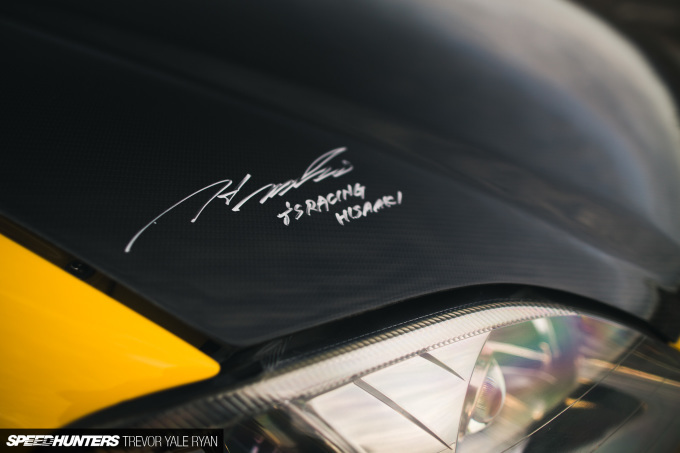 Perhaps one of my favorite touches to the whole thing is J’s Racing president Hisaaki Murakami’s signature, sharply contrasting against the carbon fiber. It’s little things like this that make cars more than just cars. Plus, the fact that it’s RHD just gives the Type Rx bonus points out here in California. Inside, the massive mod list continues. 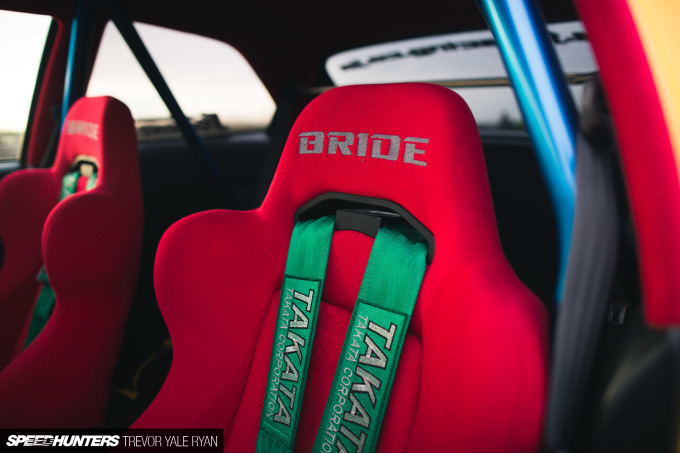 A pair of proper red Bride Ergos along with Bride pillars and headliners fantastically carry over the intent from the factory red R-spec headliner and set the mood of the interior. Along with the red-stitched J’s Racing wheel, which is also akin to the limited Type Rx aesthetic, it’s a great place to be. There are so many additions to the car that transform it from your standard Honda into something so much more. Like I said, I was really itching to get behind the wheel of this thing the longer I spent with it. A bolt-in cage from Cusco provides some added rigitity to the already stiffened Type R chassis, while a J’s Racing strut bar in the trunk furthers this end. 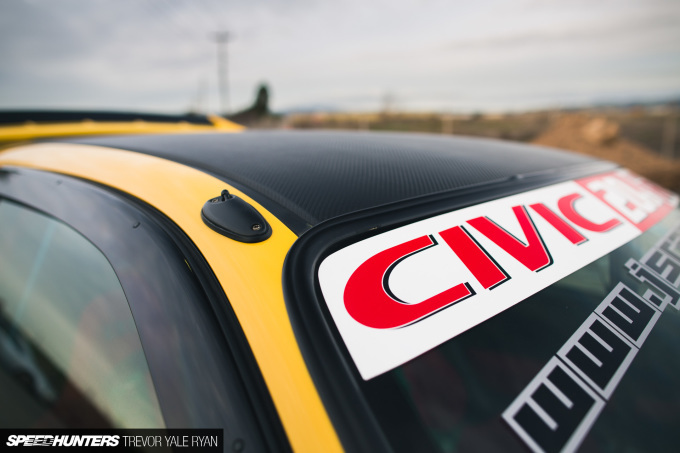 It’s seriously a good recipe for backroads fun, topped off with Takata Racing harnesses to ensure both the driver and passenger remain firmly planted when tearing up the touge. 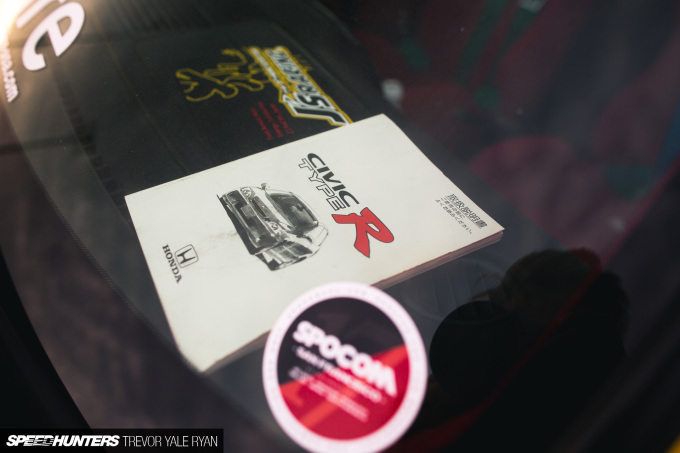 I was also quite pleased to see an original manual sitting on the dash. Then, under the hood, there’s just more good stuff, all put together so nicely. 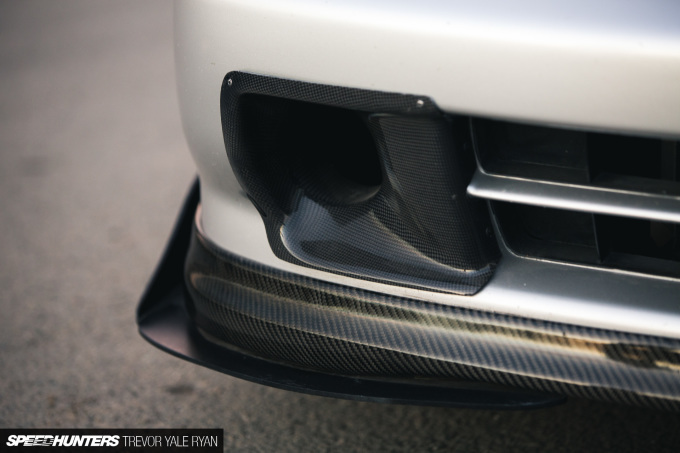 That carbon fiber intake is definitely a piece I was drooling over when the hood was popped. 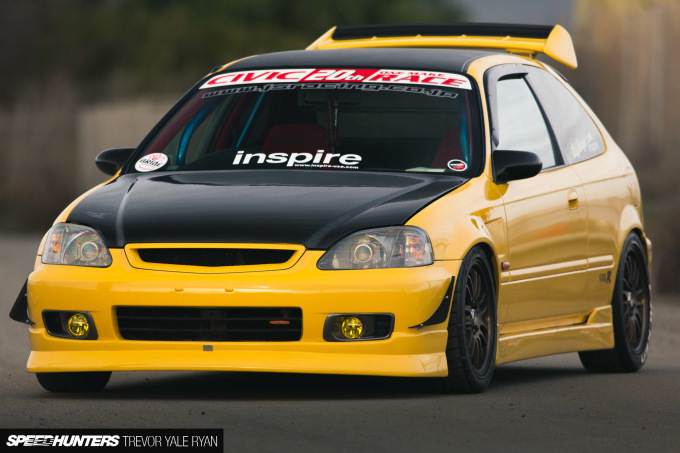 You might have sensed by now that this car is practically the J’s Racing Civic, also making use of the Japanese Honda tuner’s titanium exhaust. 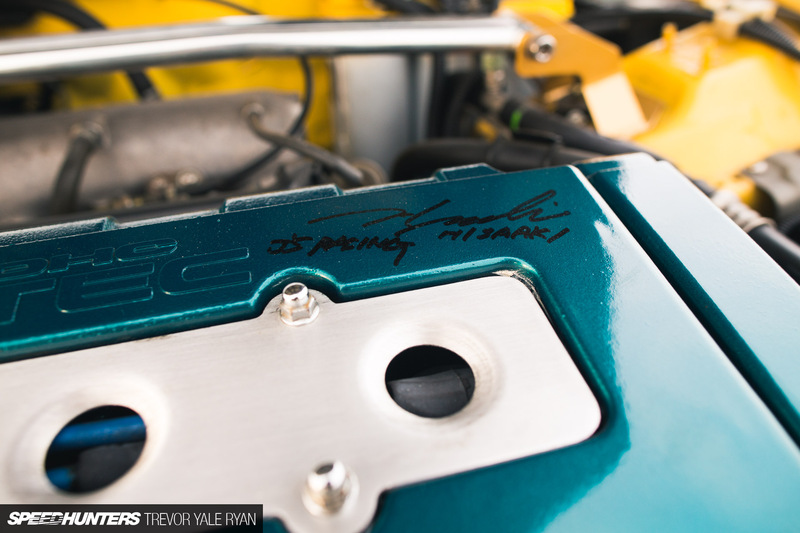 As such, Murakami’s signature also resides in the engine bay. Suspension and overall stance is improved with Cusco coilovers and Function7 control arms, while tow hooks and fog lights further the exterior aesthetic. Seriously, I could go on and on about this car. As much love as I have for the Civic, its cousin demanded some attention as well. 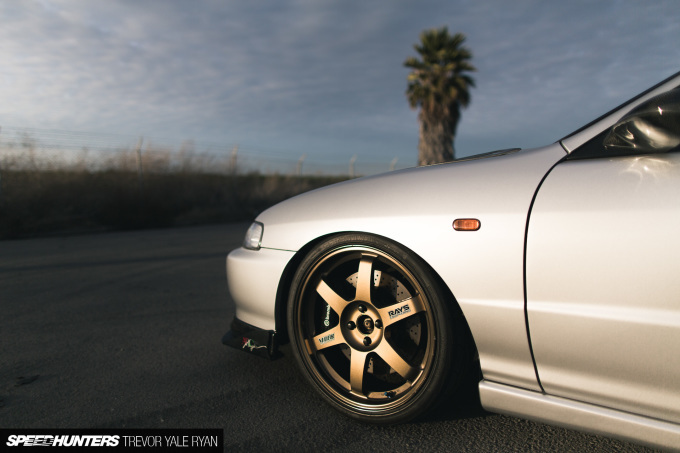 Eric’s DC2 is just as well-built as the EK9 and carries a similar aura. Classic bronze RAYS Volk Racing TE37s have been chosen for this car, and it amazes me how many different models these wheels look good on. Wrapped in some Yokohama Advans, it’s a sweet setup for the backroads. A bit more sidewall might be nice, but the larger diameter wheel doesn’t allow for this — also stuffed into the larger wheels is a Brembo GT big brake kit. Early Integra Type Rs ran a four-lug setup from the factory, but this car, which was originally a five-lug setup, was converted back just to run these wheels. The TE37 want is strong, after all. 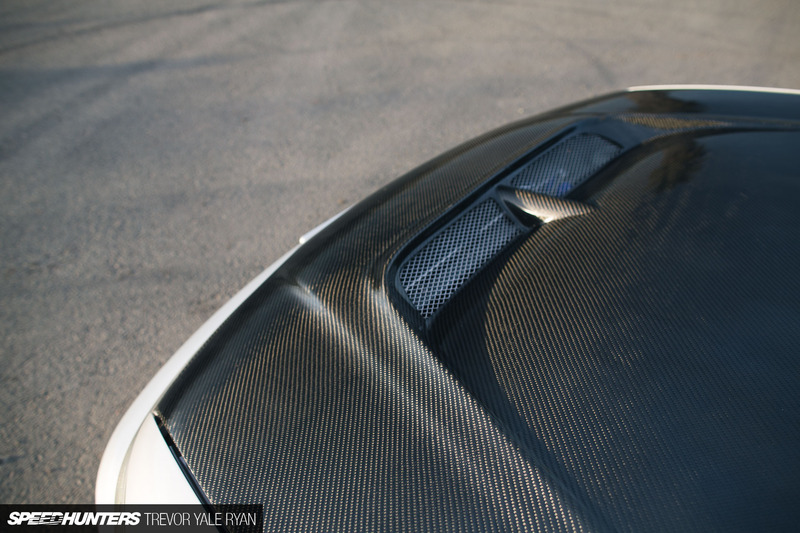 Lots of carbon fiber parts have found their way onto this car as well. 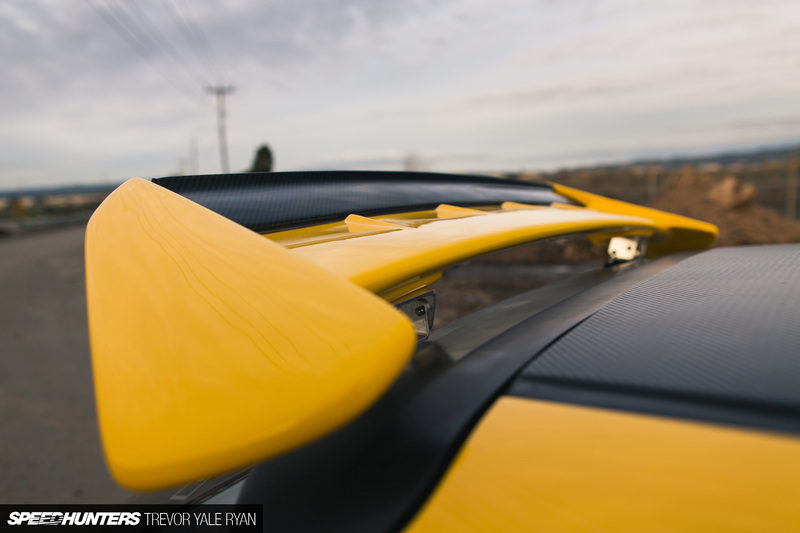 Like the Civic, the roof is one solid lightweight carbon fiber piece and I rather like the vented hood which pairs nicely with the trunk. All of these are parts you can only get from Inspire USA. 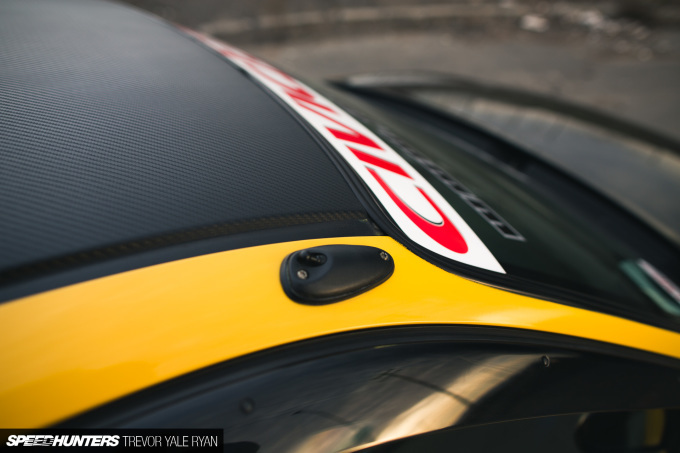 The carbon fiber ducting is courtesy of J’s Racing, as is the big rear wing. Meanwhile up front, an ARC Magic splitter helps speed up the airflow under the engine. It’s quite a good car to look at especially in that Japan-only R silver — overall aggressive looking without being too overstated. Like the Civic, it’s just begging to be driven at speed. Of course, jumping in the opposite side of the car is always fun too; helping me out on the shoot was Tony Pham, a guy I’ve become good friends with after shooting his NSX last year. Once you’re inside, it’s a similarly cozy situation. 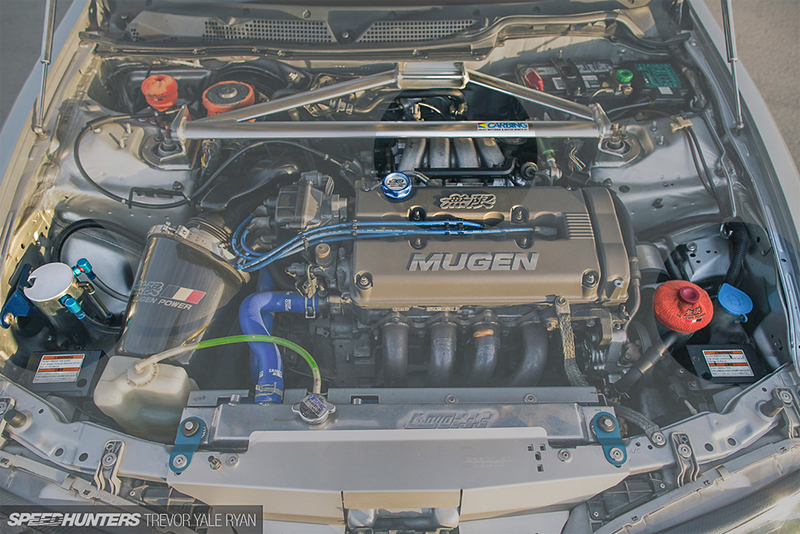 You can see right away that this build is much more Mugen based, and we’ll see more of this under the hood. All of the details are matching and proper 2000s goodness. This car also makes use of a Cusco cage along with a good bit of bracing in the back end thanks to a Next Miracle X Bar. Something I didn’t expect to see was a large pair of subwoofers in the rear of the hatch. While it doesn’t make the car any faster, at least it’s well put together — for a car where laptimes don’t matter, why not? 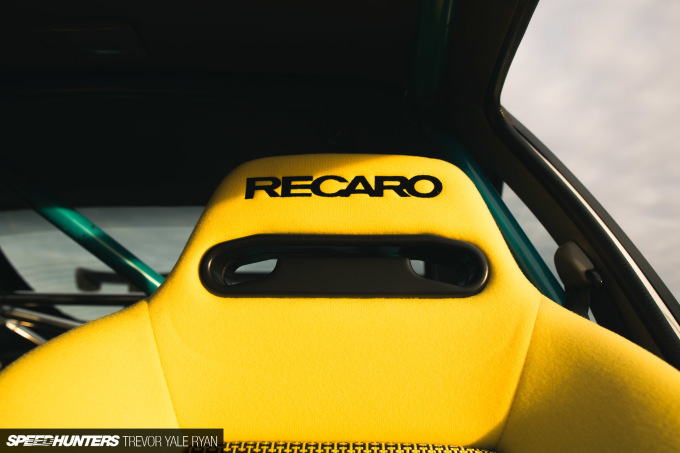 Eric also has the proper Type R-style Recaro Wildcats included in this build, and you might have noticed the yellow stitching on the shift boot matches the seats. Another Type Rx detail that’s been carried over after parts have been swapped in and out over time. 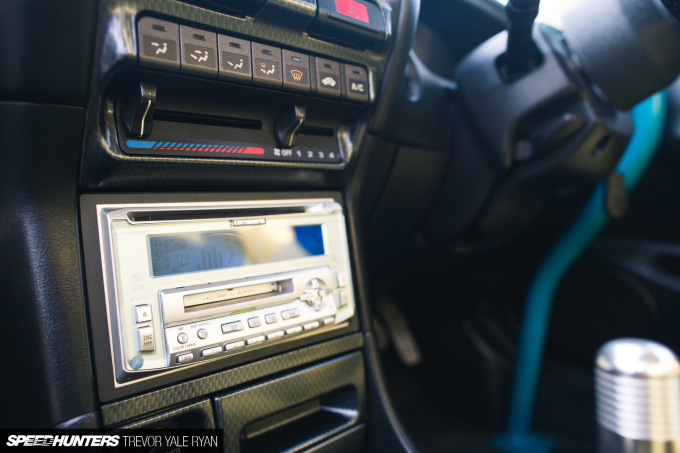 As I mentioned, the Integra is filled with Mugen parts throughout. If you managed to miss the dollops in the interior you can’t miss the name under the hood, displayed prominently on a rather rare valve cover. 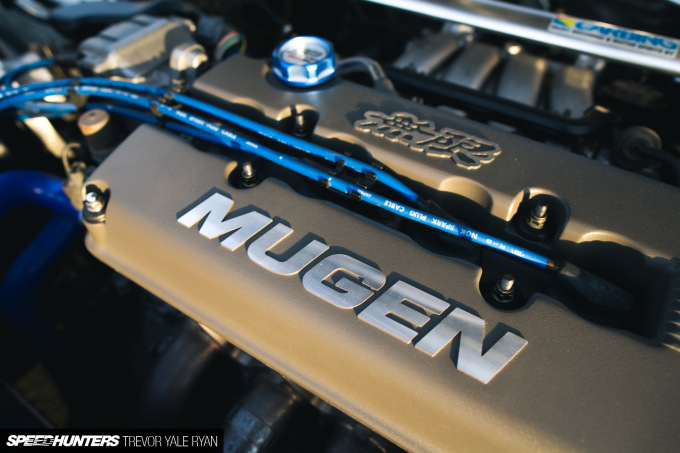 Mugen, Mugen, Mugen — air passes through a Mugen intake and out Mugen headers before being passed on to a Blitz exhaust for that unmistakable healthy Honda buzz. 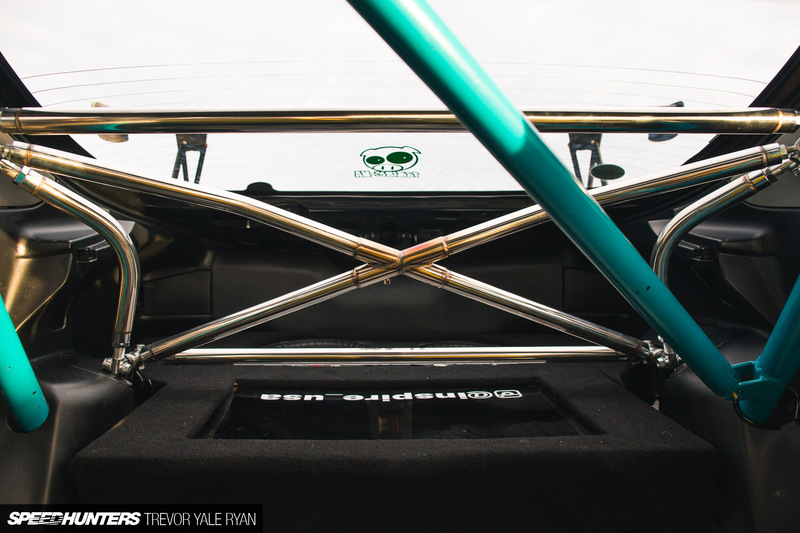 The Integra also makes use of Function7 control arms, like the Civic, however the suspension has been replaced with Tein coilovers in the DC2. In my opinion, the car sits just right in this form. So Which One Is The One? So there you have it, two Type Rs, built in similar fashion. But which is the better one? Before I shot the cars, for no particular reason (besides my childhood preferences, and perhaps Initial D) my choice would have been the Civic. 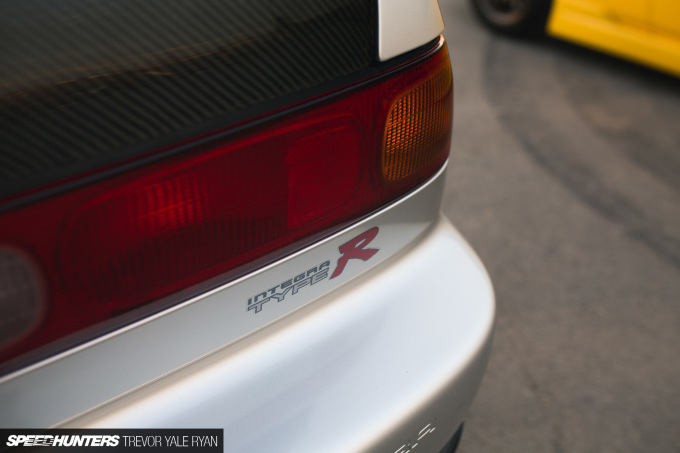 And if we go off the photo count alone, the yellow Type R seemed to command more of my attention. 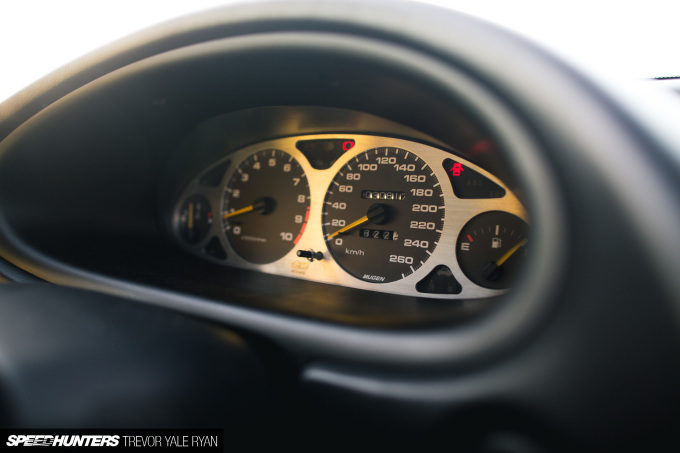 I figured the EK9 was smaller, more nimble, and probably more fun to drive. But by the time the sun went down, I’d learned a few things that I went into the shoot not knowing. 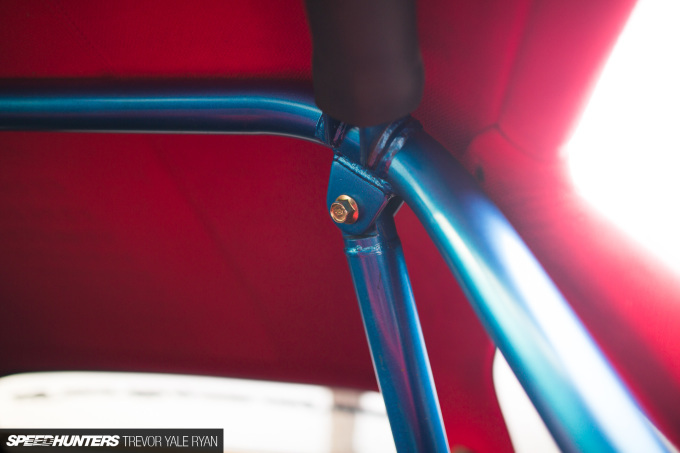 The wheelbase of the EK9 is actually 50mm longer, not to mention the overall height is nearly 70mm taller. I was right about the Civic being the lighter of the two, but with the Integra making more power it’s a bit of a wash. I set out to make a definitive decision, almost sure that I would leave this shoot confident that one was better than the other. In reality, that just wasn’t the case. The one I would prefer to take for a drive was the one I was last looking at. 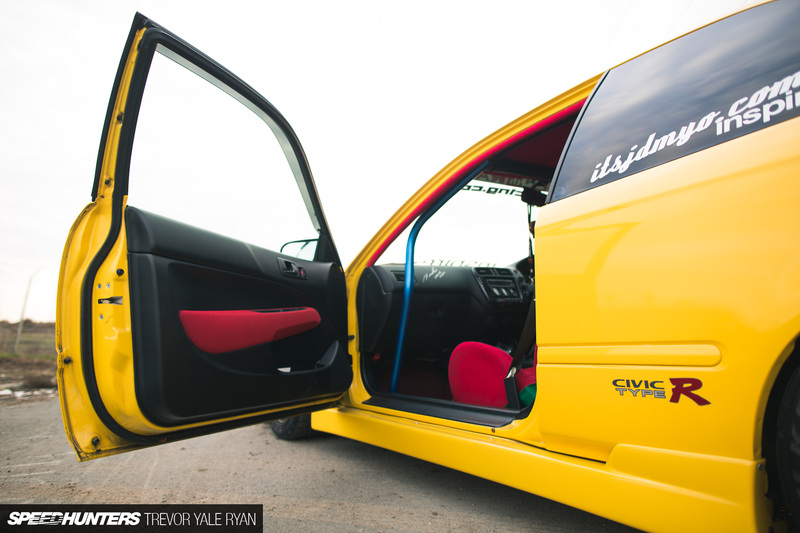 If it really came to it, I do suppose I’d take the Civic – but not for any particular reason. I’m quite dissatisfied with this indecisive result, but I suppose this is why Eric refuses to part with either one. More importantly, which is the one you would have? I don't understand the apparent skepticism? 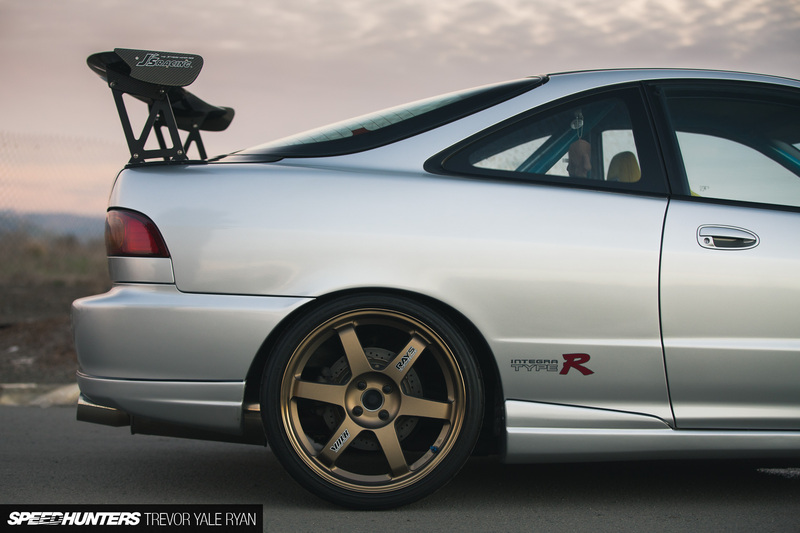 The '96-spec DC2 Integra Type R both in the UK and Japan had four-lug wheels; The '98-spec upgraded to 5-lug wheels later on. 94-95 ITRs had 4 lug. 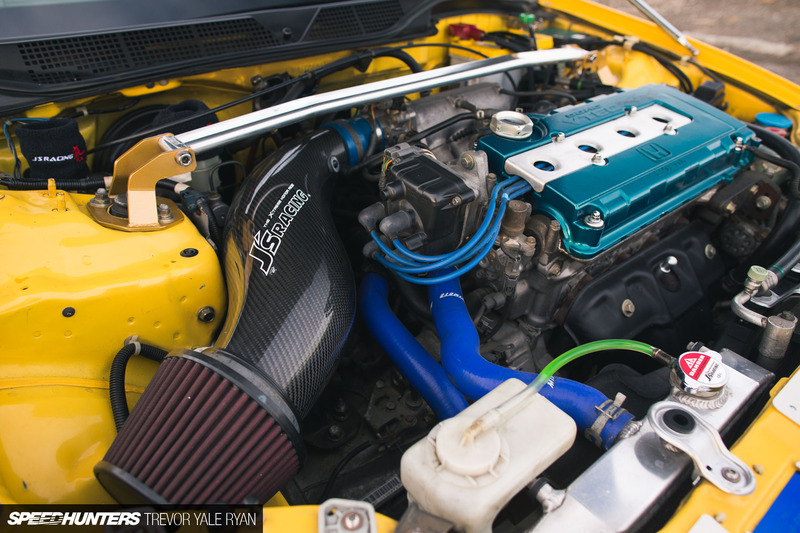 The intake manifold is the bigger conundrum...Massive wheels and sub setup aside. 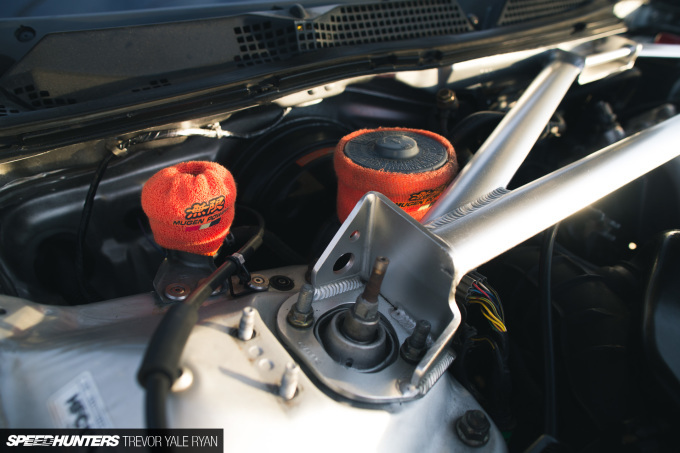 It has a GSR head on the ITR block for better compression to get more torque out of the motor. As for the wheels, I mentioned it was originally a 5-lug; I've seen photos with the original wheels on there but it's impossible to fit the BBK without going with bigger wheels. Knowing the owner, he probably has all the original parts in storage and he'll continue to play with the setup as he sees fit. It's his car after all. 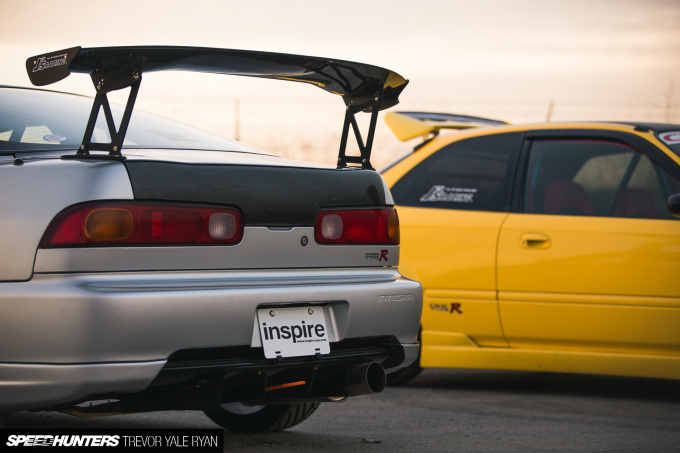 at first all in with the yellow hatch but when I saw the side view image of the integra with that yellow wildcat. it makes me question my decision. But after all in Philippines there are few integra's so with daily use and track days for better aftermarket support here. 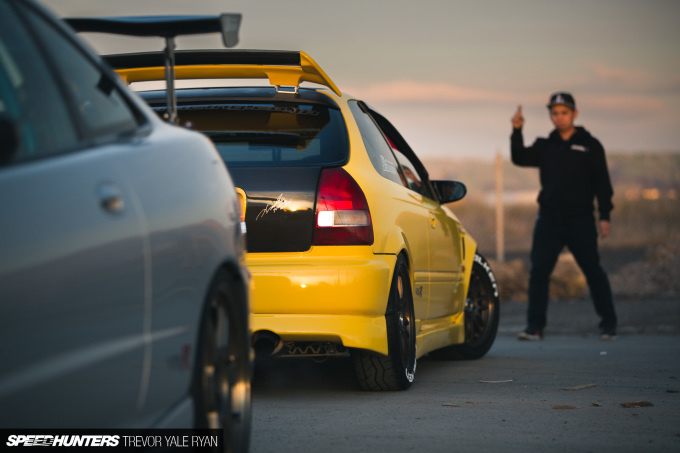 I'll choose the Yellow Civic. after all they are both amazing. Drool worthy!! Thank you for providing me with enough wallpapers to last the next month. Not enough Honda features on this site. 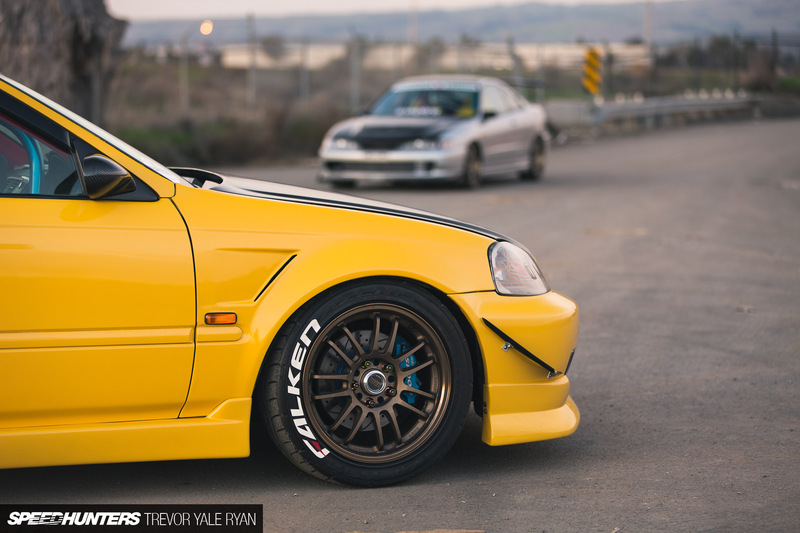 Not talking NSX or S2000, but any number of incredible Civics, Integras or DC5s that are out in the world. 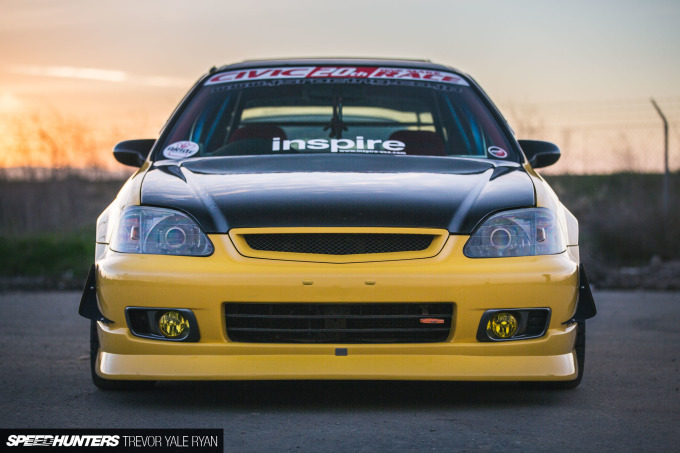 Plenty of fresh, A+ Honda builds out there that are more than worthy of a feature. A tear of happiness has dropped when I saw the theme of this feature. Loved It!! I'd take the integra more because it's got somewhat more power, I just like the looks more over a hatchback, and it actually looks dailyable with subs and a cool interior and whatnot. I'd take that one. I was thinking the same thing. That Mugen valve cover isn't authentic. Any info about the power developed by the engine (both of them) or power to weight ratio since it was stated as general and would like to see some numbers to check all when comparing. Usually i like the integra but i didn't bite the color combination, on the other hand the civic could be the best i have ever seen. 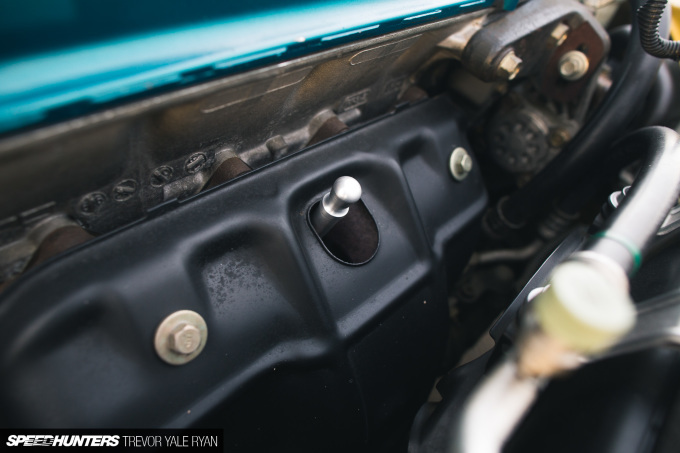 Fake Mugen valve cover on a B18C1 out of a GSR in the Integra, makes me wonder if it's even an authentic Type R, or just an RS with a 5 lug swap and engine swap... or a GSR with a RS/Type R roof skin grafted on. People need to stop putting those junk Cusco cages in their cars. 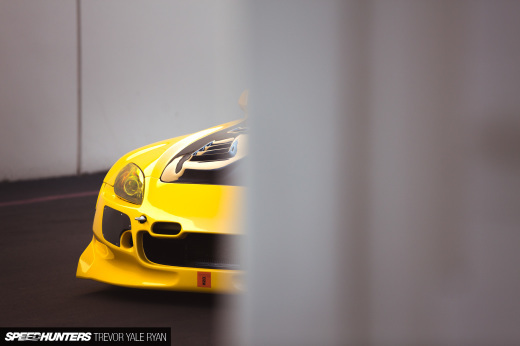 They will never pass tech inspection in any sort of race, they'll crumple in a roll over. Just wasted money and added weight. Just noticed the Integra isn't even 5 lug, so it's either the early 4 lug Type R or it's not a Type R at all. Yeah, it's been converted to four lug like I said in the writeup. 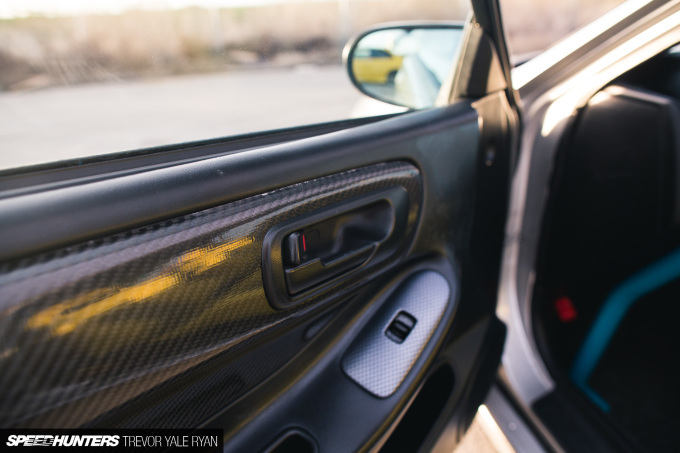 I think the owner just wanted to do something different when he was stuffing the BBK in there — no way it would fit with the original Type R setup. It says that it's swapped to 4 lug so TE's can go on the car. I have to aggree with you about these Cusco cages, they are useless and ugly in the same time. 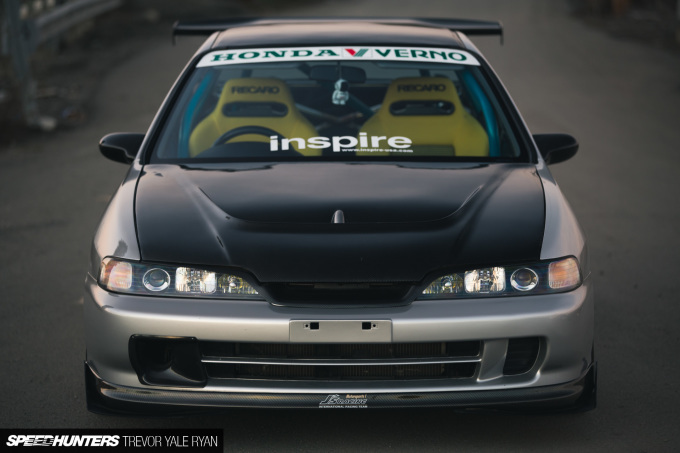 I like Hondas, even more nicely built Hondas... and those two have some nice and expensive parts thrown on them, but I just don't understand how that Civic is trophy winner with the oversprayed grill mesh and windscreen liner, they could spend a bit more time on the details. 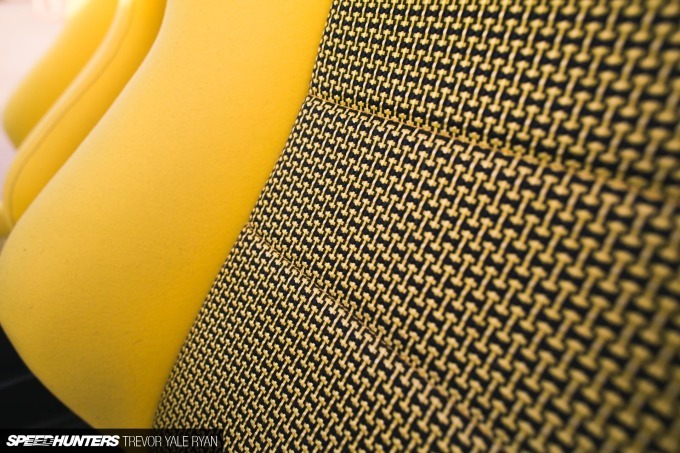 side-skirt and body color , they are different shade of yellow. but maybe we are too strict ! Am I the only one who prefers the quad rounds of the USDM dc2/4 integras? 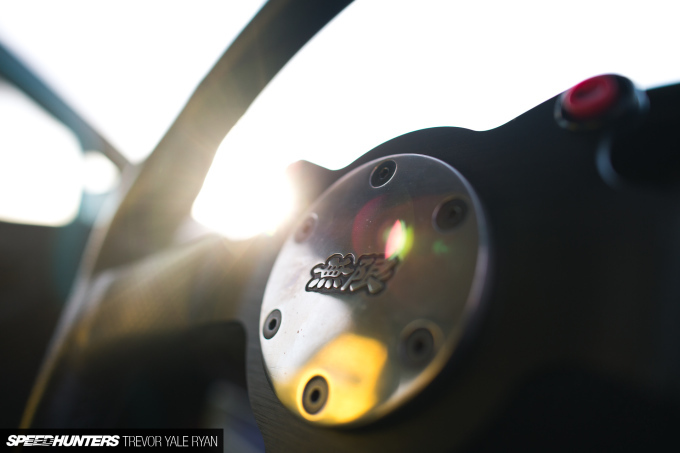 Speedhunters filtering comments? Trying to post a comment, but it doesn't show after refresh. 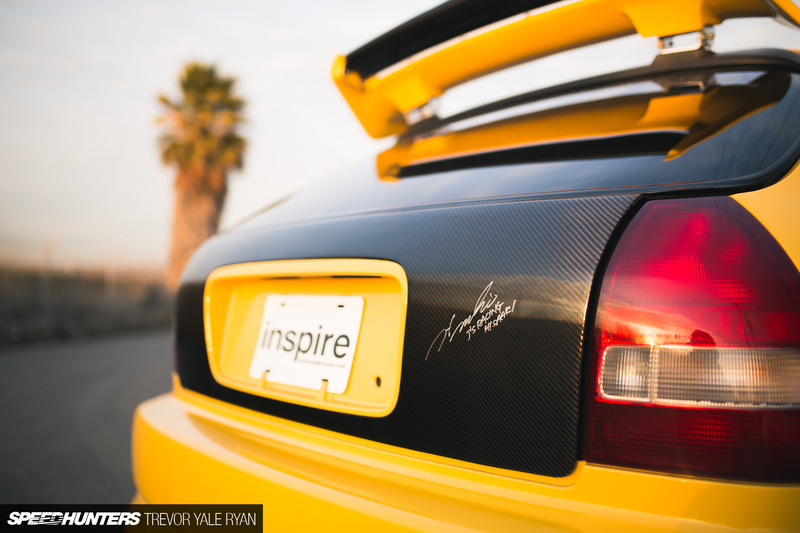 For sure it's not an authentic ITR. Engine is clearly a GSR because of the intake manifold. Front passenger side behind the catch can there is a hole for the stock intake box that ITR's do not have. And windshield washer reservoir is not for HID equipped cars which the Type RX model came with standard. By the way, those parts were just swapped out when the head and other parts were upgraded. And the hole you spotted was for another intake that Eric was running previously. Good eye, though! See above regarding the intake; the head was swapped for higher compression. Don’t know why this guy is faking the funk, but this for sure isn’t an ITR. Like others have said, that hole on the passenger side is a clear giveaway. All models but the ITR had that hole. One wouldn’t just cut a hole there for an intake. It's a shame to be stuck on this, but the owner and his shop work directly with a number of Japanese companies, so lots of non-Type R parts have been in both chassis over the years. This guy has had more cars than I've had decent pairs of jeans, so drilling a hole in a Type R to test a few parts isn't that crazy. I won't pretend I'm up to speed on all the ins and outs of these cars, but it's a Type R VIN so that should settle that. Besides, I know the guys over there well enough to know they wouldn't muck about like that. There are so many things pointing to the fact that this isn’t an ITR. 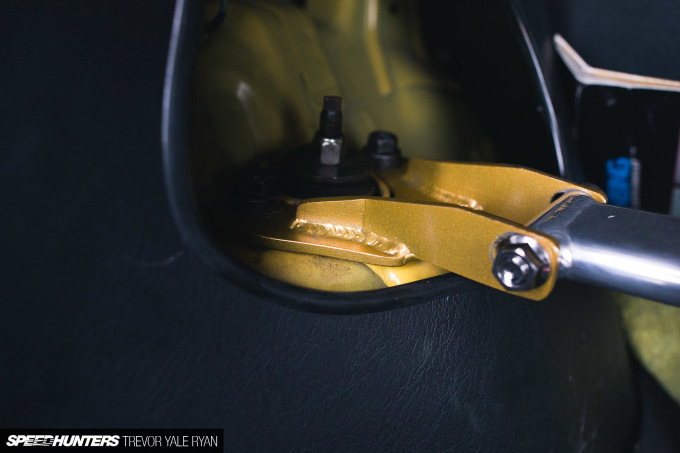 Even the brake master cylinder is wrong. You say it’s a 2000 Integra Type RX yet the brake master cylinder is from an older model Integra. just admit it already everyone want one of this badass ^ ^ i'm a nissan lover, but i want one of this. 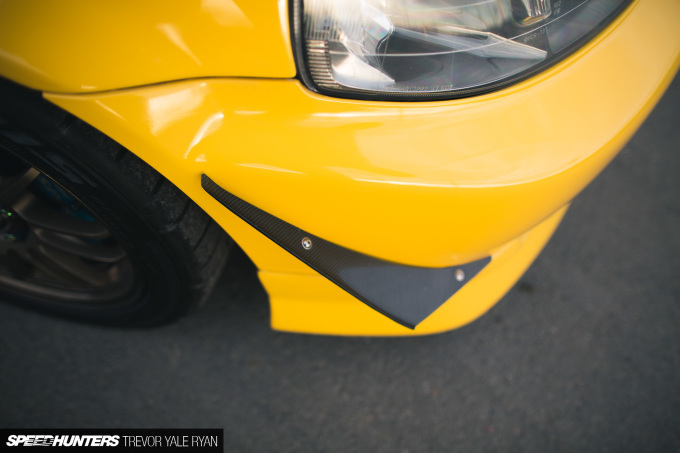 Shouldve kept the OEM lip kit on the EK9 imo, but to each his own.. 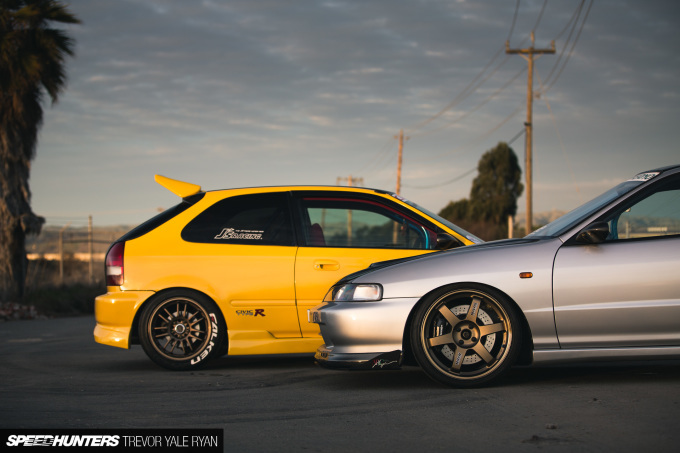 When Russell Bulgin compared these two in stock form (DC2 and EK9), he came to the conclusion that the Integra was clearly the better drive. I also prefer the sleeker looks, plus they are easier to find - all in all, I'm not really sure why one would seek out an uglier Civic, personally. More like this please! Love both these cars. No way could I choose between these cars. As soon as you put up an argument for one, the other one catches your eye. 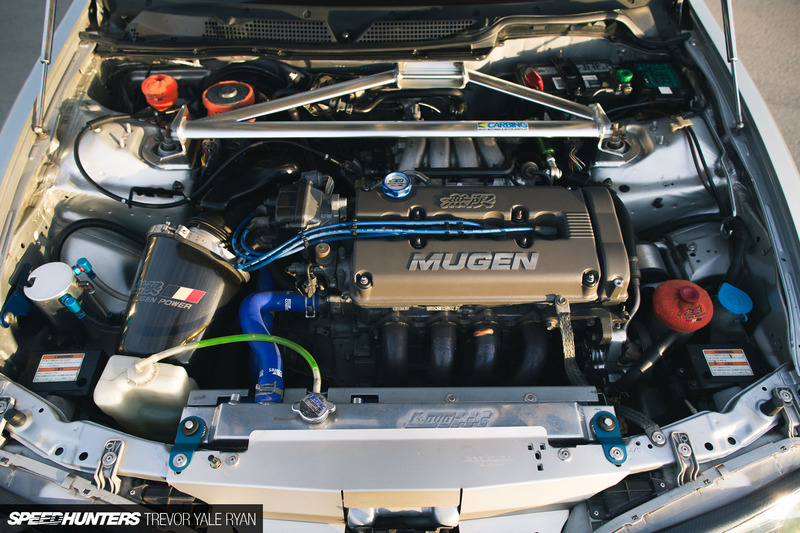 That fake Mugen valve cover really makes me cringe. Very quality built with high end parts on both of them!!! Don’t understand all the skepticism, this man clearly knows his parts. 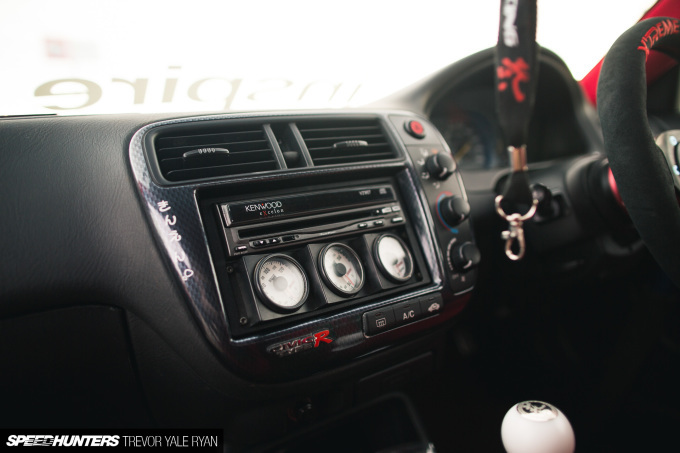 That steering wheel alone is the price of my car. Kudos. 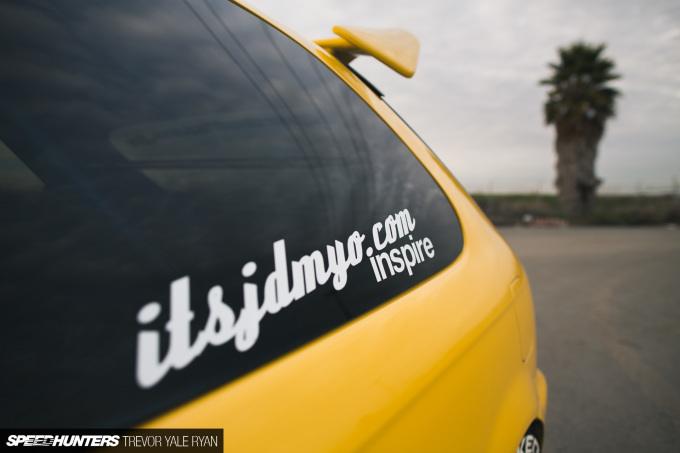 I dislike the way this article iver glorifies the type r model as well as puts down non type r civics and integras. 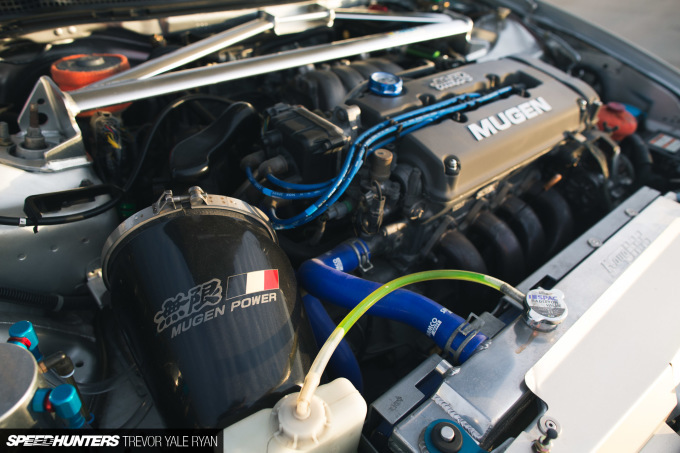 There are plenty of really good quality builds that started as eg4 or ek1. 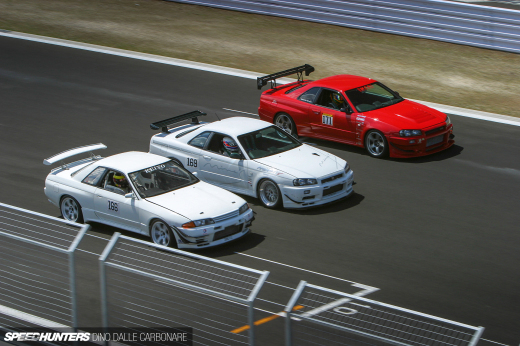 There are also cars wich i consider imoressivegor what they are like ef9 and eg6. To see someone who really doesn't care for FWD Hondas get excited over these cars, I'll fully accept his lack if enthusiasm for the baser models. My first car was actually an 89 Civic hatch, it was a great first car but I never saw the sense in modifying it. Sadly, most of the modified Hondas I see now have just been made into worse cars. Sure, there are plenty of great builds that started as a base car, but for every good one there has to be at least 100 horribly modified ones; it's just the truth of any car that you can pick up for around $1000 now. I'll be a Honda enthusiast until I die, but the comments in here show a sad truth of the H community. So many haters! And you're not even correct in your call-outs. You don't see this much bs following any other article on here! Way to represent, guys. Me, I cant decide which is best either. Very similar cars, yet still too different to compare. I'd do certain things differently, but both are brilliant builds. I especially love that they both avoided the trendy K-swap and stayed true to their period. Your first paragraph here is spot on haha...thank you for that. Anyway, I feel the same way about how these were built. 2000s performance and aesthetic, very true Honda vibe to me. should've kept the oem lip kit on the EK9 though..
Integra, but with the thicker sidewall of the Civic.